Dumbbells form the core of a home gym. They are essential tools for every fitness enthusiast to improve strength and form. Buying dumbbells as a set is a great idea as it gives you more training options. And if you buy a set, getting a rack along with it is highly advisable. Having massive free-weights strewn across your floor will look messy and can even be dangerous. A rack will save you a lot of trouble and space as well. These are soft neoprene coated dumbbells. They dome in different colors. 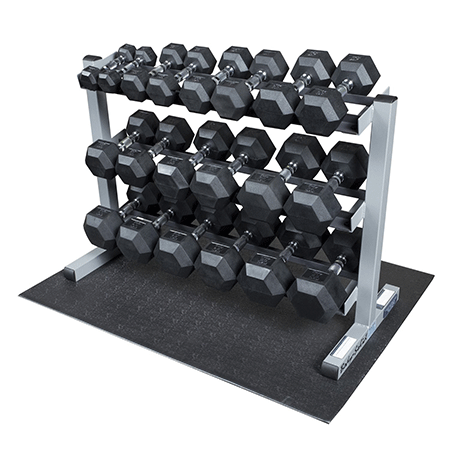 The vertical steel rack has horizontal dumbbell stands. There are two options to choose from, one with three weights and the other with five weights. The weights start from 2lbs and go up to 10lbs. Neoprene is very soft and comfortable to hold. Protects the cast iron metal from corrosion. The rack is compact and easy to move around. This one is a slightly more advanced set with six different sets of weights. The smallest one weighs in at 5lbs, while the heaviest is 30lbs. 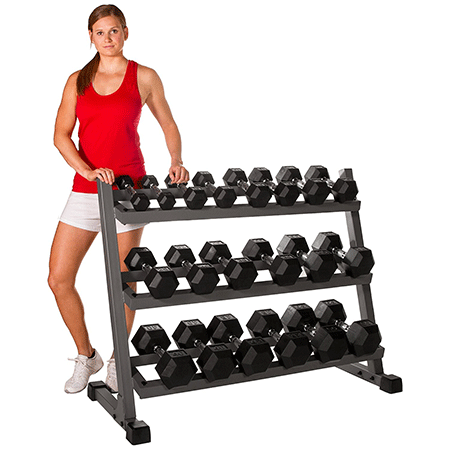 The tall vertical rack has two sides to hold one dumbbell each. It can be placed close to the wall or in the center of a room. The weights are all coated with black rubber. The black rubber coating makes the package more durable. A bigger set that included heavier weights. Hex dumbbells for improved safety and convenience. This is a huge set, with ten different pairs of weights. It is more suitable for smaller professional gyms and the more experienced fitness enthusiasts. The cast iron dumbbells have a gray paint finish and come in hex shapes. Weights range from 5lbs on the lower side, while the heavier options can go all the way up to 50 and then 100lbs. A wide selection of weights to choose from. Available in both painted and rubber coated options. Durable build quality, and safe hex shape. 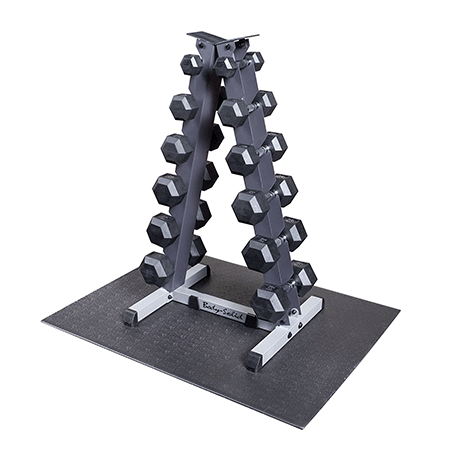 A great addition to any commercial or home gym, this set features weights ranging from 5-50lbs, available in 5lbs increments. That amounts to 10 pairs of dumbbells. The four-sided vertical stand is very well designed and is one of the highlights of this package. 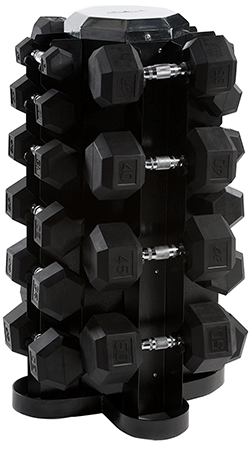 The rubber covered weights offer extra protection and durability. Excellent vertical stand takes up very little space. A nice amount of choice in weight classes. Hex shaped for extra safety. 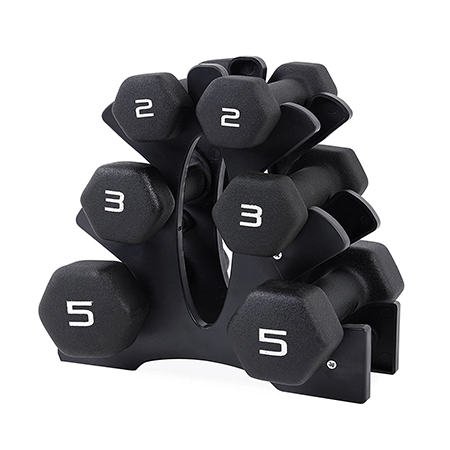 You get ten pairs of premium rubber coated hex dumbbells in this package. The included rack is a 3-tiered horizontal design, and sports tilted shelves for easy access. The cast iron heads have recycled rubber coating, which improves durability and safety while being environment-friendly. There is 5lbs of spacing between the weights, with the lightest being 5lbs and the heaviest 50lbs. Innovative rack design for improved access. A complete package of weights for the home gym. This brand comes with a lot of variants and options to choose from. The model is almost identical to the other Fitness Republic set reviewed above. But the difference lies in the weight categories, with this one sporting heavier weights going all the way up to 20lbs. The dumbbells get the same colorful neoprene coating, which is a premium in this category. Even the handles are neoprene-coated, which makes them very comfortable to hold. Great looking dumbbells in pleasing colors. For those who need a wider range of dumbbell weights to choose from, this massive set from Body Solid is a great pick. It has no less than 14 different pairs of dumbbells. The weights range from 5-70lbs. This is a commercial rated product that would be perfect for a fitness club as well. The rack is a 3-tiered, horizontal variety with ample storage space. The dumbbells are rubber coated. Comes with a rubber floor mat. Great option for commercial gyms and seasoned pros. If you want a very cheap set of weights, you can’t go wrong with this one. It has just three sets of dumbbells, weighing between 2-5 lbs. The weights are all fully coated with high-quality neoprene for increased comfort and durability. Along with the set, you get a very snug looking rack to hold the weights securely. There is also a heavier 30lbs version available. Ideal for a small home gym, and even for trips. Hex shape and neoprene coating make these weights very safe and durable. 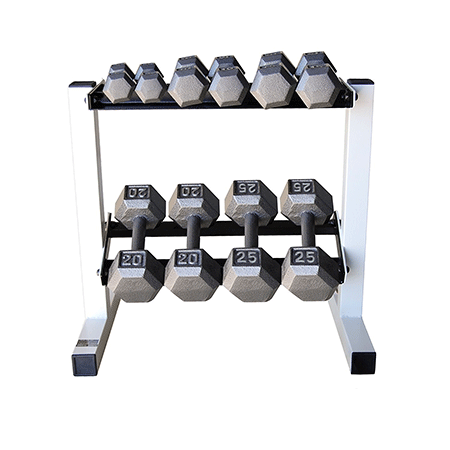 Another humongous set with ten different pairs of dumbbells, this one is for the seasoned lifter or a commercial gym. 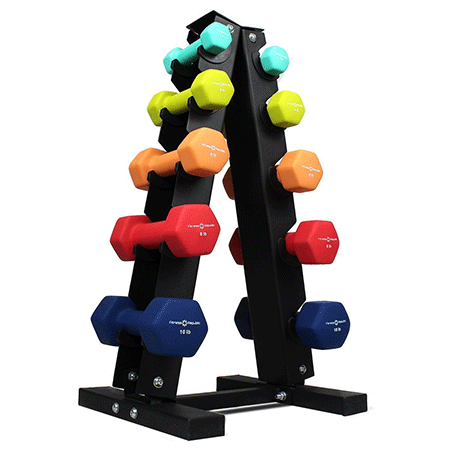 The weights are black, cast iron pieces with a coating of high-quality rubber. 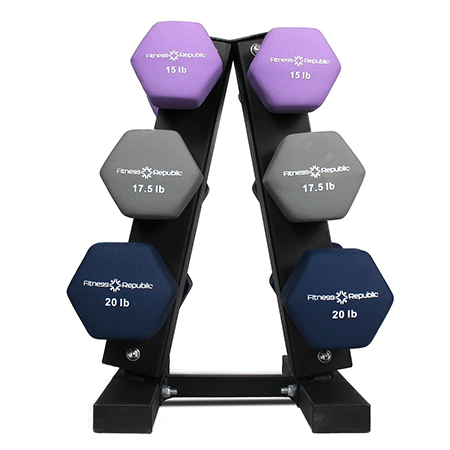 These hex dumbbells are available in weights ranging from 5-50lbs. 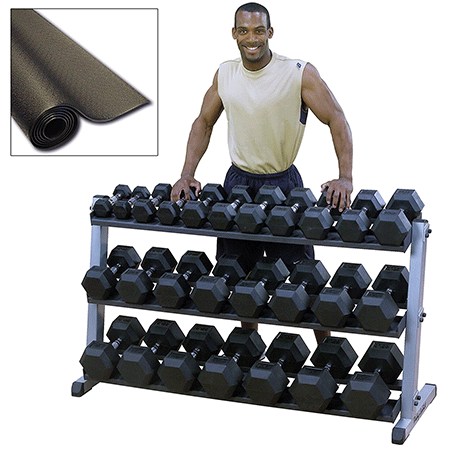 You also get a sturdy PVC rubber mat to protect your floor from any falling weights. Broad and comprehensive set of weights. Durable construction, with protective rubber coating. Comes with a rack and rubber mat. A large set of dumbbells needs not cost a ton of money, as exemplified by the number one pick in this list. These small silver colored weights come with a two-tiered rack for safe storage. The weights are evenly spaced, with the lightest rated at 5lbs and the heaviest at 25lbs. That kind of weight range makes this an ideal choice for the beginner as well as seasoned fitness enthusiasts. Hex design with an attractive silver finish. The rack is very easy to put together.